Our client, a Hispanic male, was working underneath a metal bar that was holding cow hide pelts. The bar fell and landed on him, paralyzing him. At that time, he was living in an antique camper that was not handicapped accessible, and he was forced to live in a nursing home for two years while his case was pending. Our firm helped him receive a lump sum settlement, plus a structured settlement. The lump sum was used to buy a new home and have it made handicapped accessible. A handicapped accessible van was also purchased for our client at the time of settlement, and he will receive $50,000 every five to seven years to buy a new vehicle. He and his family will receive roughly $11,000 per month for life to compensate him for his wage loss and ongoing medical expenses. Because he was not a legal citizen (undocumented alien), a trust was created to legitimize the receipt of payments into a legal entity, and Attorney Hoggatt serves as the Trustee. Hoggatt Law Office, P.C. manages all of his finances and pays his certified nursing assistant (CNA) for attendant care. Our client was a professional painter who fell down an elevator shaft during construction of a large scale custom home. When he hired our firm, he had already resolved his home modification and handicapped accessible van issues. We were hired to handle his claims for wage loss and medical expenses. We were able to get him a structured settlement which provides compensation for his wage loss. A separate part of the structured settlement goes into a Medicare Set Aside Trust (MSA) that is professionally administered by a Third Party Administrator (TPA). The structured medical settlement is paid to the TPA to cover his CNA (attendant care). The wage loss settlement is paid directly to the client. 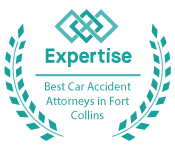 Our client was injured in a work-related rear-end car accident on I-25. He required surgery to reconstruct torn ligaments in his dominant right wrist, several injections in his neck due to a herniated disc, and eventually a discectomy/fusion surgery. He had a permanent impairment rating of 28% and was advised that he would need surgery to have his wrist fused in the future, which would significantly impair his range of motion and function. He was completely unable to work for an entire year, resulting in a wage loss of around $80,000, and his medical bills were over $100,000. The workers' compensation case brought in a total of $95,000, and we reached a settlement with the at-fault party for policy limits of $100,000, as well as an additional $400,000 from uninsured motorist (UIM) coverage.